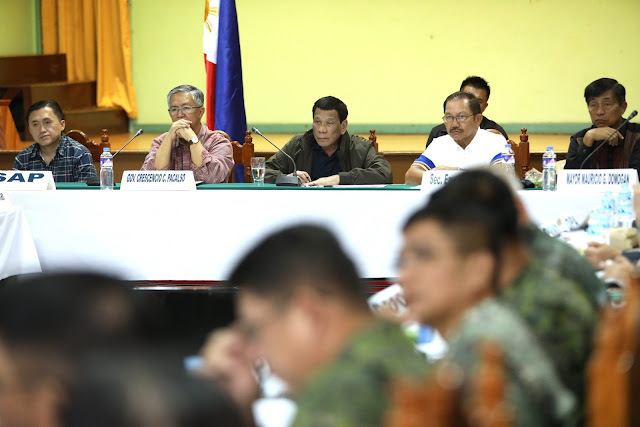 MANILA -- President Rodrigo R. Duterte on Tuesday urged the public to send donations for victims of Typhoon Ompong (Mangkhut) to the government, particularly the military, and or humanitarian organization Red Cross instead of private TV stations. Duterte claimed that he personally saw how staff members of a TV station, which he did not name, would sort out donations that were usable for them. Duterte, meanwhile, said he was unsure about calling for a revolution against mining, noting that it has “abused” the resources of the country. He criticized “mining people” for occupying and mining watershed areas. “I don’t know if I’d have to call a revolution just for mining. Revolution in the sense that I’ll not use the arms but I’ll force them out,” Duterte said, adding that he would have to consult with his economic team. The mining industry has been contributing at least PHP70 billion to the government every year. “I do not hate mining--it’s allowed but I would say that the time has come when our motherland is overused and abused and this cannot go on,” Duterte said. “I’d like to ask them how much PHP70 billion can do to the country if you compare it to the losses of the Philippines because of mining,” he added. Duterte earlier said he would someday confront Congress on the need to close the mining industry following the Itogon mining site tragedy. “He (Duterte) has insinuated already that it is right time for everyone to consider doing away with mining,” Presidential spokesperson Harry Roque said.